My husband and I are oatmeal eaters. Every morning for breakfast we have a bowl, it's good for you, it's filling, and gets us ready for the day. 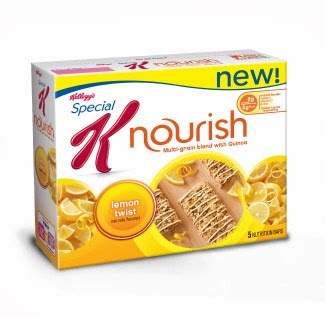 I am so excited to tell you about Special K Nourish Hot Cereal and Nutrition Bars. First of all, the hot cereal has a little container on the top with "add-ins" that you mix in to your cereal. 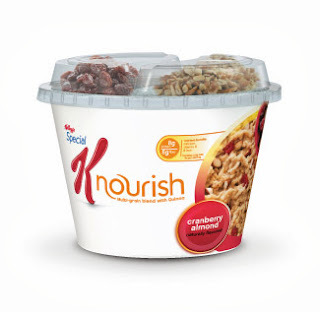 The Special K Nourish Hot Cereal comes in 3 flavors. My favorite was the Maple Brown Sugar Crunch, and my husband really likes the Cranberry Almond. I love that these are "hot cereal" not oatmeal, because what that means is that instead of just getting "oats" in your breakfast, you get a blend of oats, quinoa, wheat and barley. Special K Nourish Hot Creals only have about 5g of fat per serving. Next, the Special K Nourish Nutrition Bars. These bars come in 3 varieties as well. While the Lemon Twist is by far my favorite (I love everything lemon!) the other 2 flavors are both really good. These bars are made with the same 4 whole grans (oats, quinoa, wheat and barley) and have 6-7g of fat per bar. With 5 grams of fiber per bar, they are also really filling! Great for an afternoon snack. You can purchase the Special K Nutrition Bars in the nutrition aisle of most supermarkets, and the Hot Cereal in the cereal aisle.